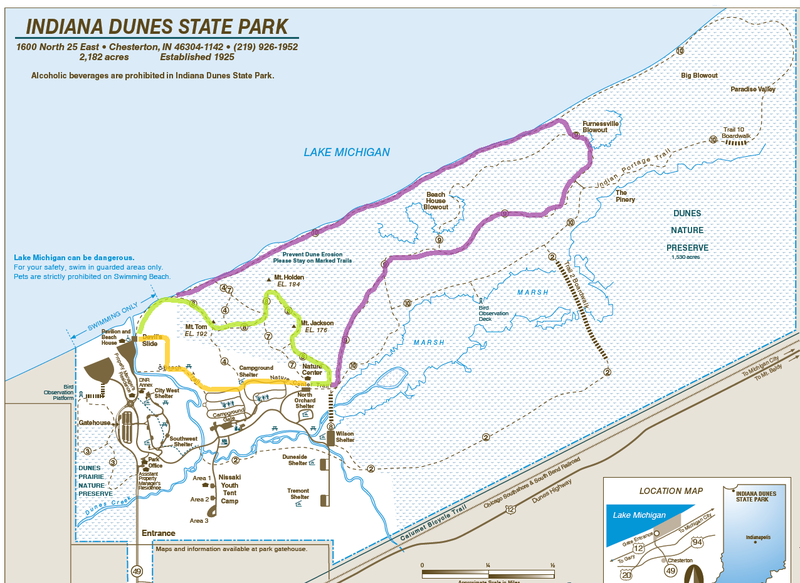 Indiana Dunes State Park is located in Chesterton, Indiana on the southern shore of Lake Michigan. The park is about 5 hours from St. Louis, Missouri and about an hour away from Chicago. 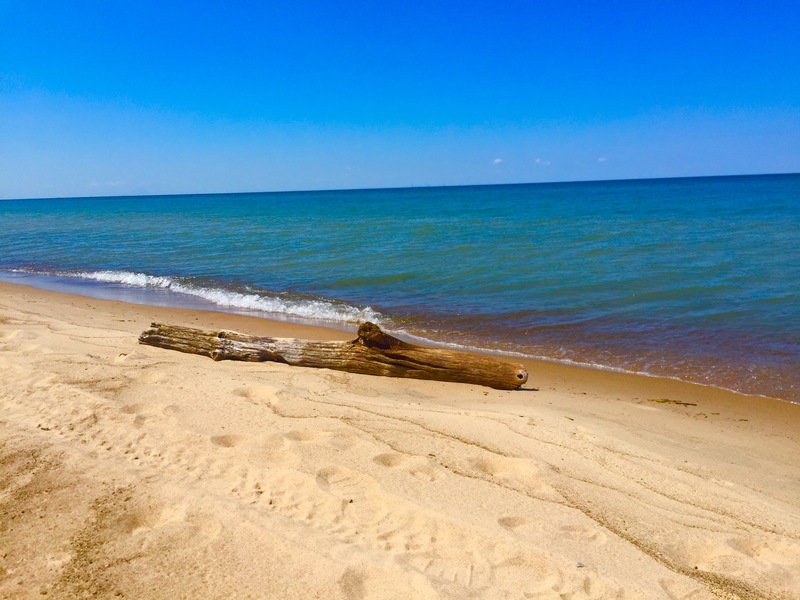 If you live in the Midwest and are looking for a beach experience, this is a great alternative to driving 14+ hours to Florida. 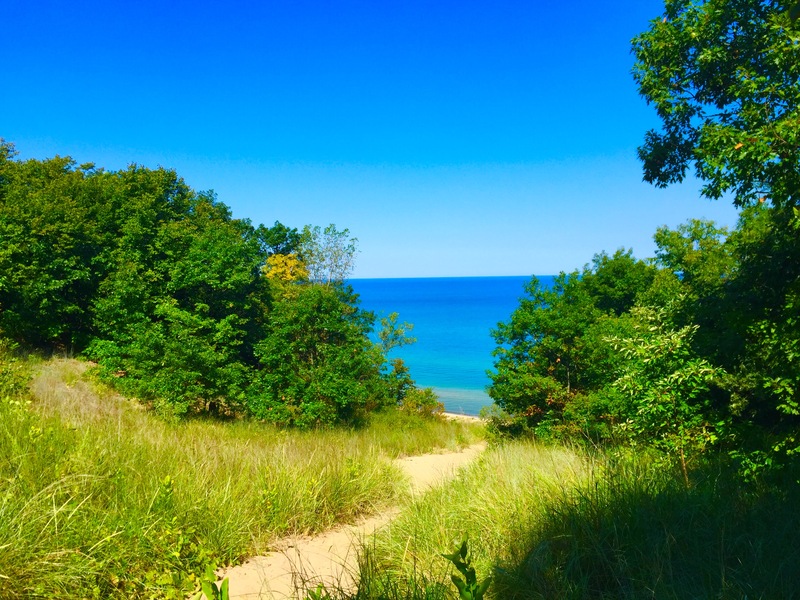 In 1925, the state park was established, preserving the beautiful and unique landscape for generations to come. 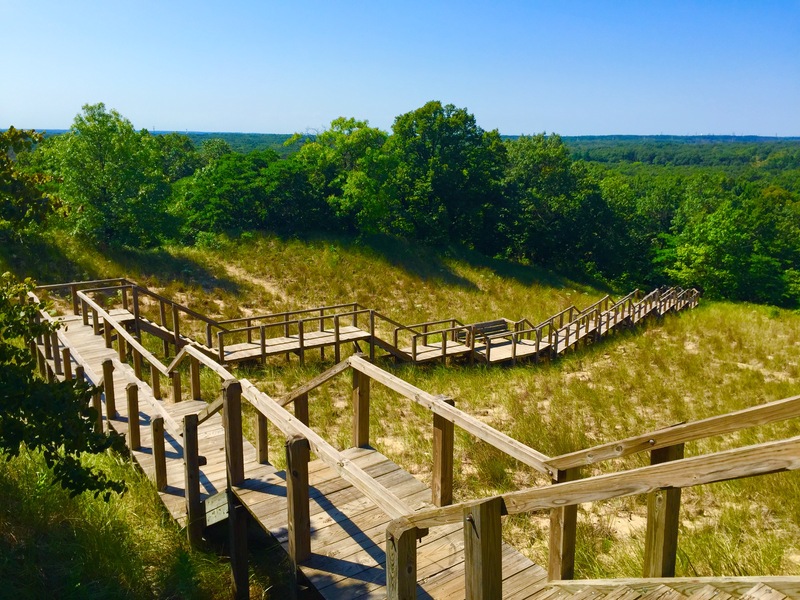 As a reminder, you do have to pay a fee to enter Indiana state parks. Since we were out of state residents, we had to pay $12 a day to enter the park. We parked in the main parking lot by the pavilion. A new “Comfort Station” was just built next to the old pavilion and it has nice restrooms, outside showers and changing rooms. The old pavilion which seemed to be a topic of much criticism, looked like it was undergoing renovations. If you are looking at the beach, to the right of the pavilion is the imposing sand dune called Devil’s Slide. We started out our hike here and climbed all the way to the top. 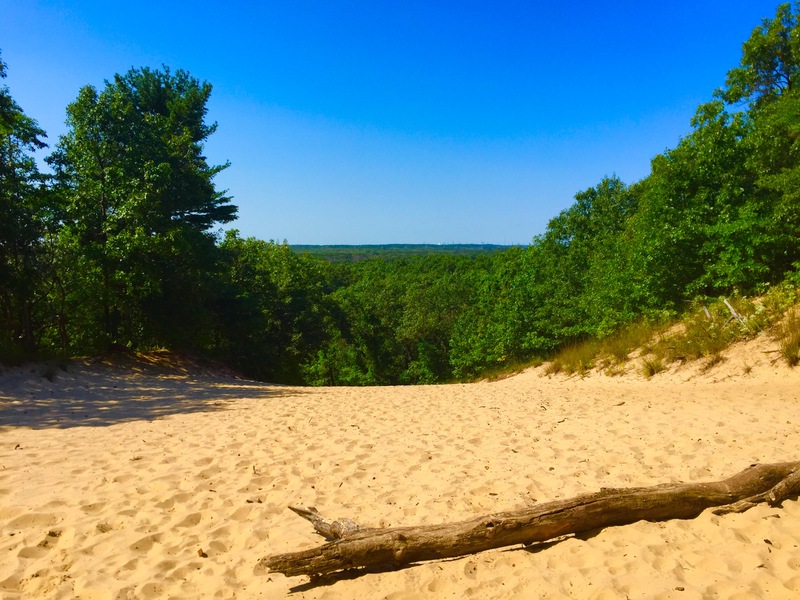 I have never hiked in sand before and wow, I was not expecting how challenging it could be. It feels like for every two steps you take, you slide back one. 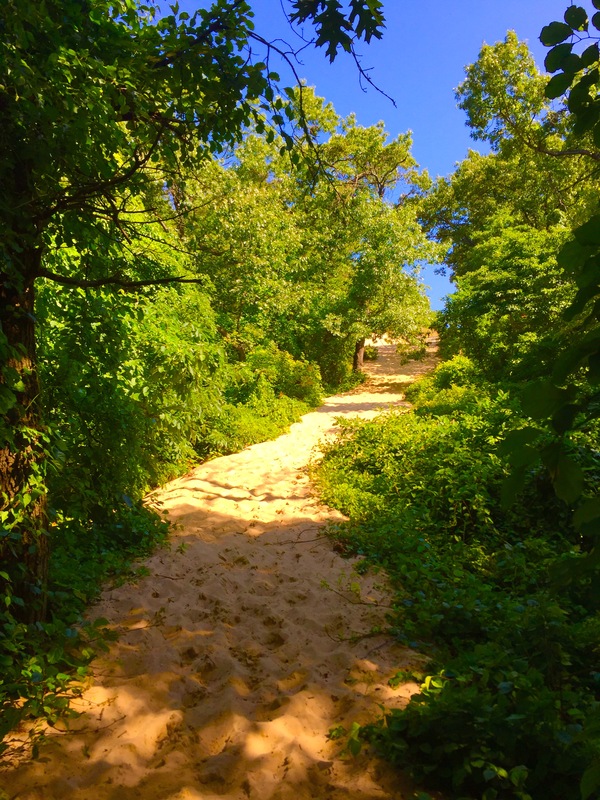 Once you get to the top, turn around and look back down at the beach. 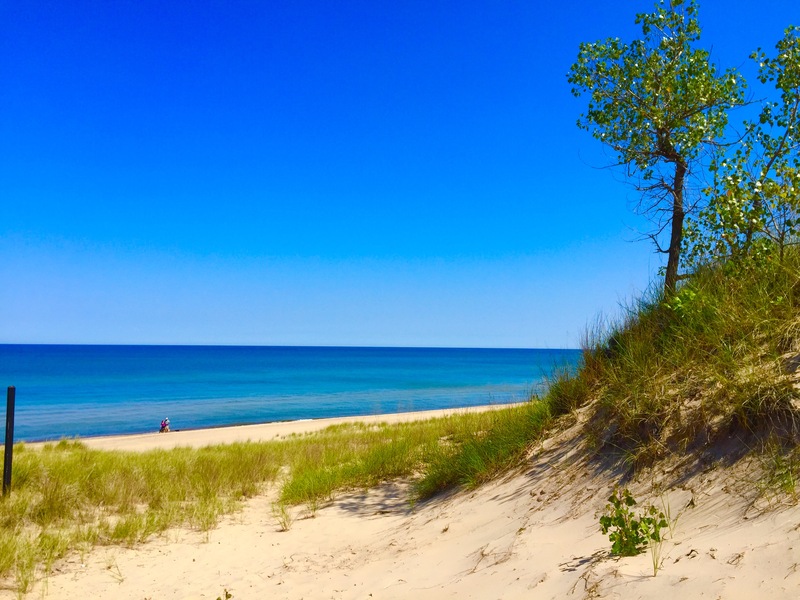 The blue waters of Lake Michigan stretch forever. 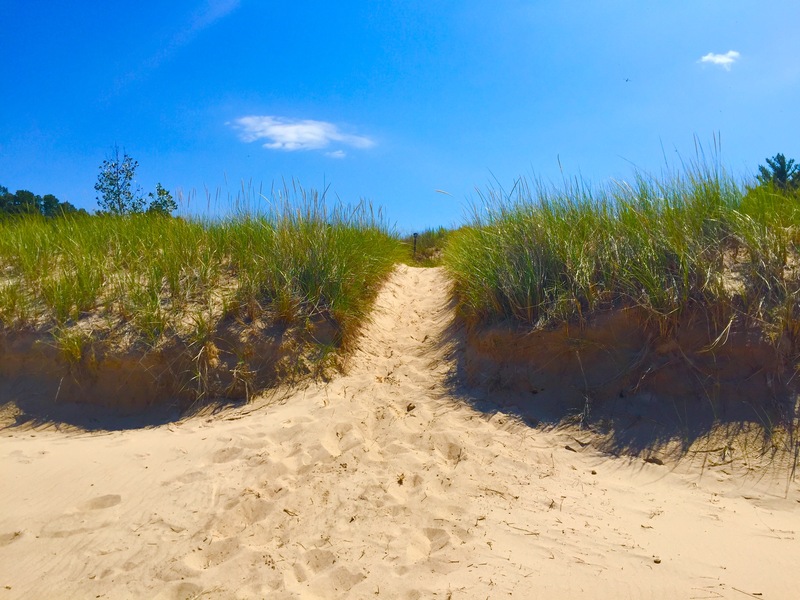 We went down the backside of the dune and met up with the boardwalk on the Beach Trail and took that through the back of the campground, to the Nature Center. 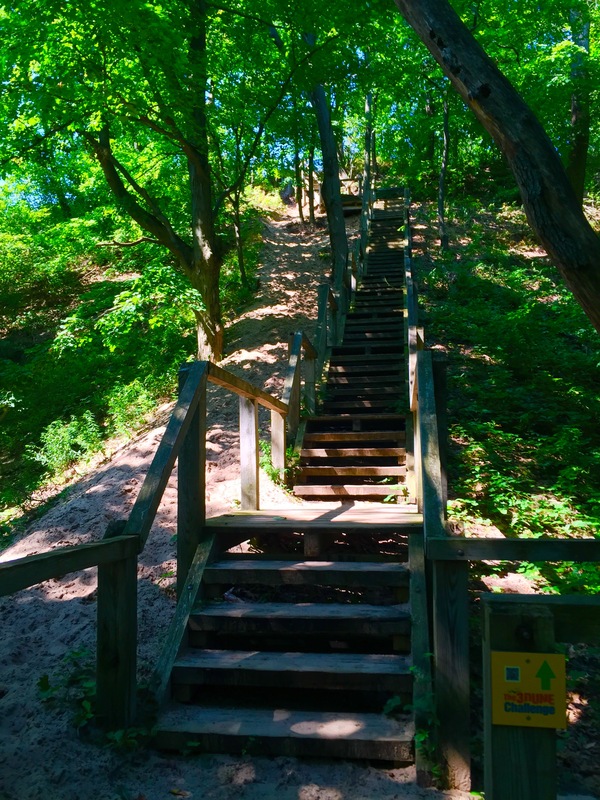 Indiana Dunes State Park has what the call the “3 Dune Challenge” where you climb to the top of the three highest dunes in the park. 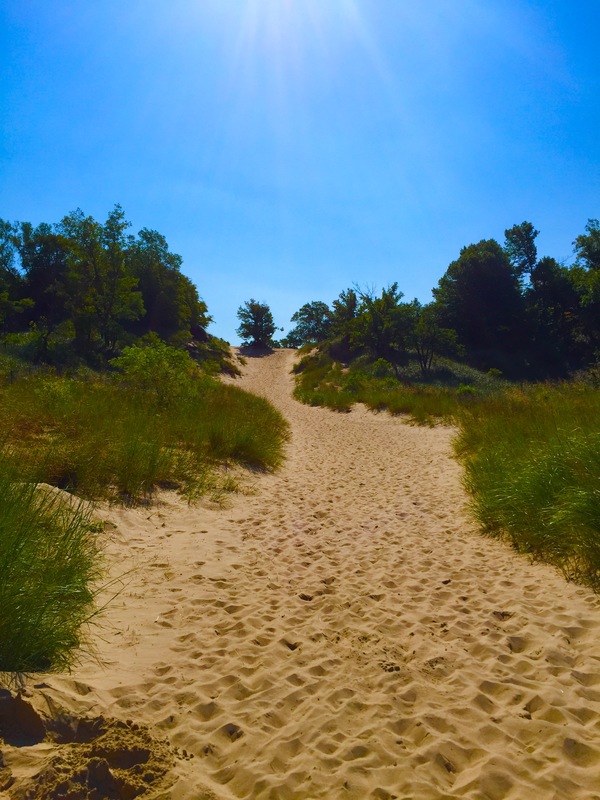 From the Nature Center, Trail 8 leads you on an exhausting route to the tops of the dunes. 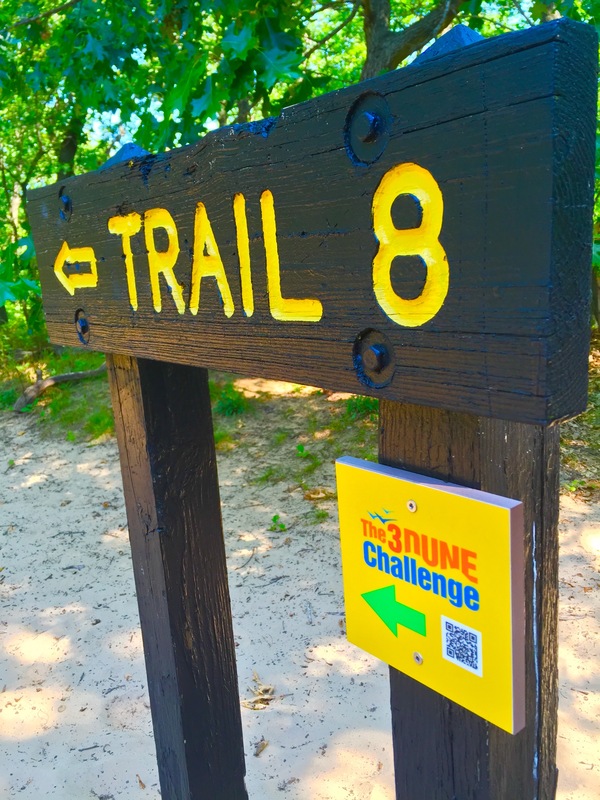 The trail is only 1.5 miles long, but you can expect inclines up to 40 degrees. That’s steep! Mt. 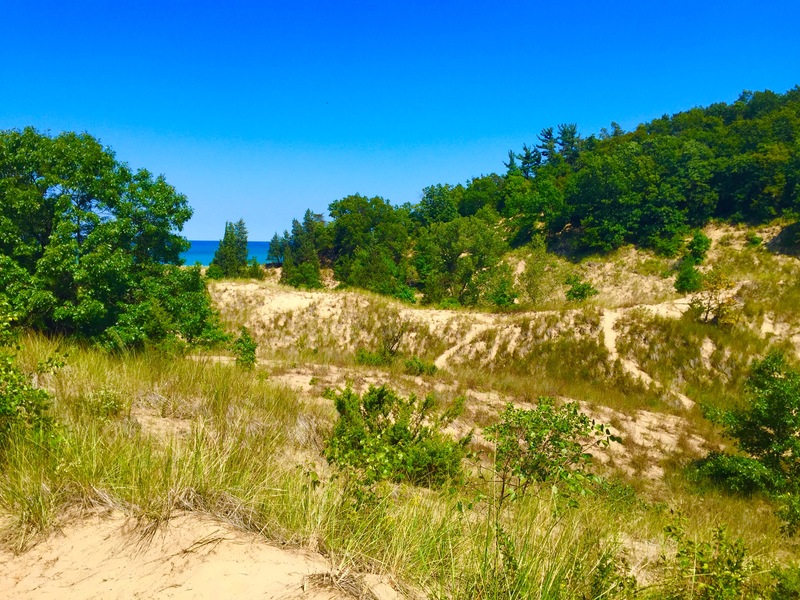 Tom is the tallest dune in the park at 192 feet above Lake Michigan, but probably the easiest to summit since a set of stairs help you reach the top. 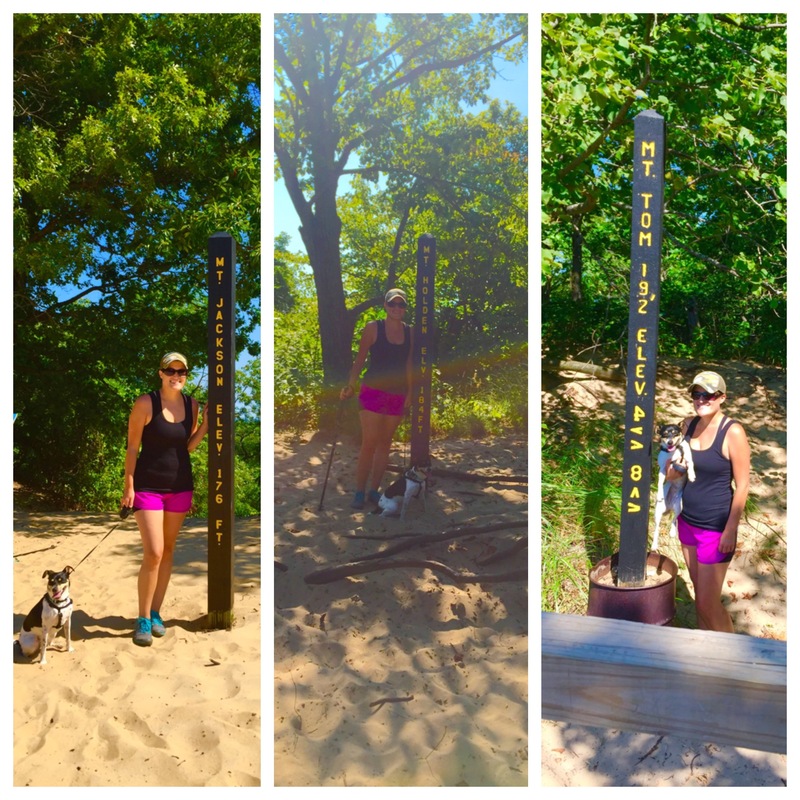 We completed the “3 Dune Challenge”!!! 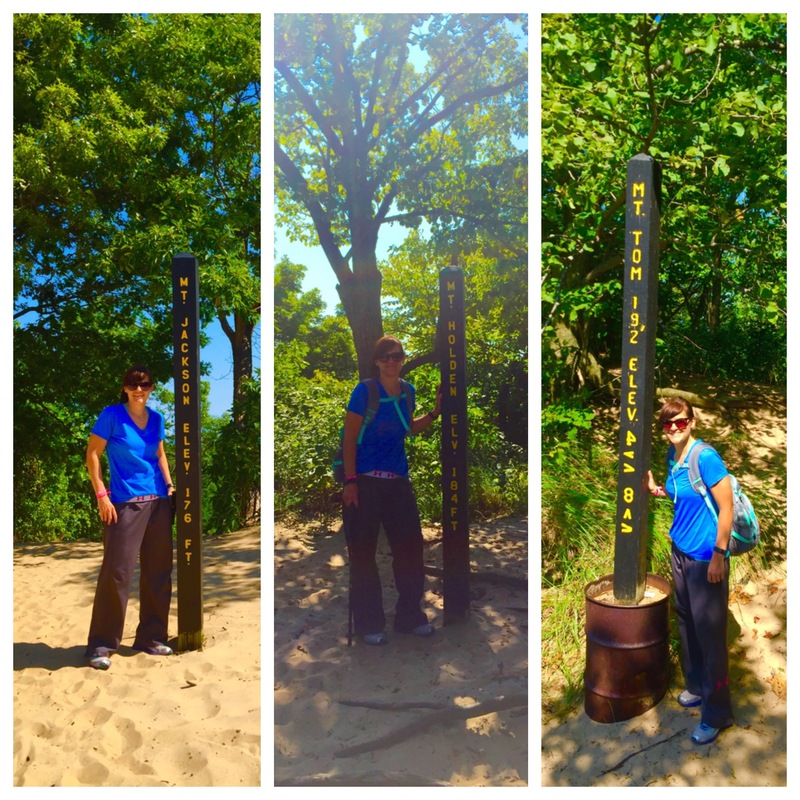 After that, we stayed on Trail 8 and took it down to Lake Michigan. The shoreline is beautiful. 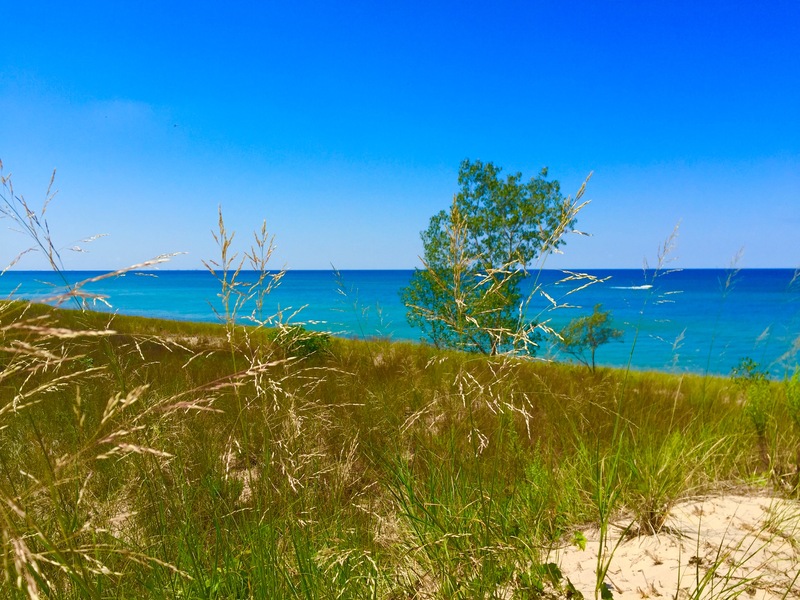 Sure, in the distance you can see the factories and smoke stacks that line the lake, but you can easily appreciate the crystal clear, turquoise waters of Lake Michigan. We also hiked part of Trail 9 which leads through the forest. 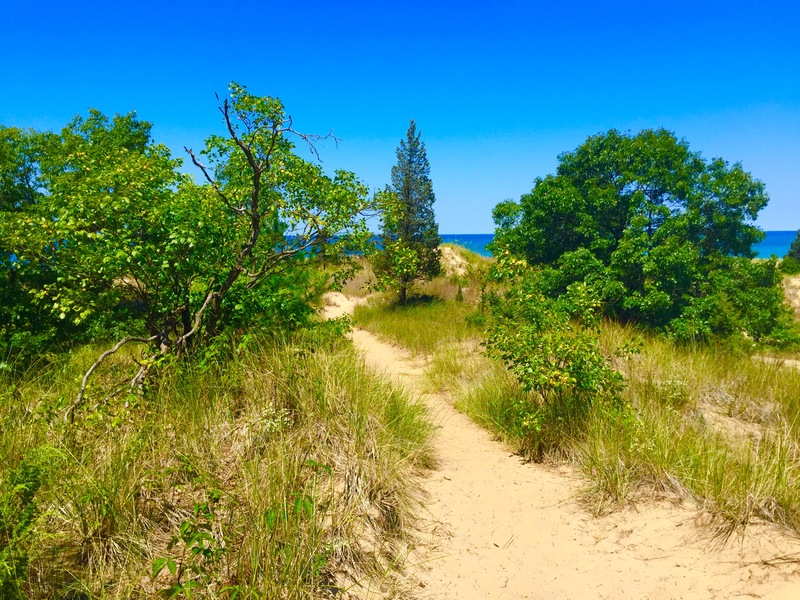 A little over halfway, the trail splits and leads back to the Nature Center or you can take the trail over some smaller dunes to the lake. The landscape is really something that was difficult to wrap my head around. Sure, I have been to Florida and have seen the dunes there, but I don’t ever remember seeing dunes quite like this. We walked the beach back to the main beach area. 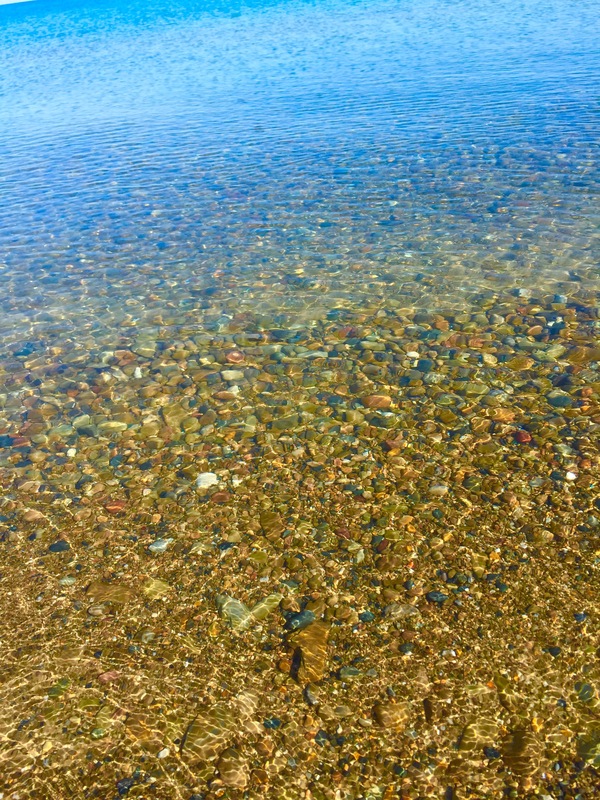 I loved how clear the water was. 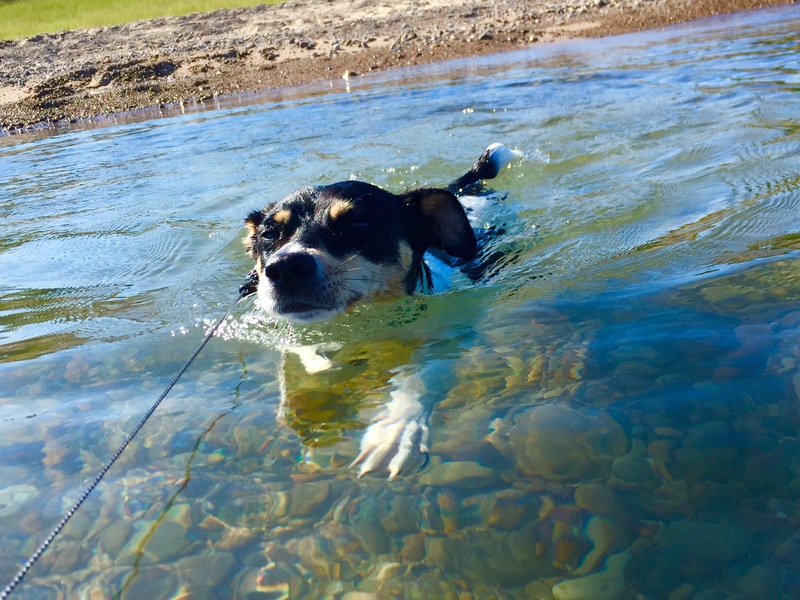 El even swam a little bit, even though she doesn’t like to. 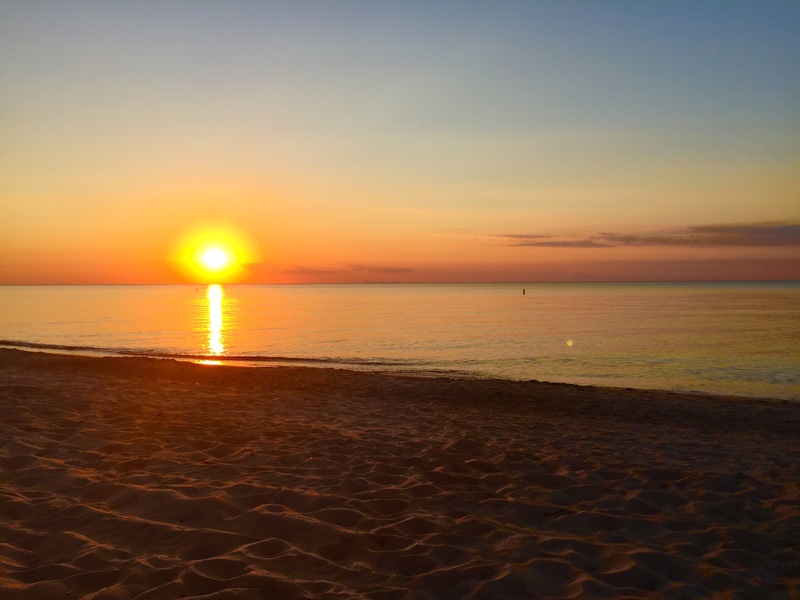 After checking into the hotel, we came back to the beach and watched the sunset. The park is open until 11 which is perfect to catch the sunset. In the far off distance, you can see the Chicago skyline. The sun slowly meets the horizon and the sky turns into a beautiful mix of orange, red and purple. 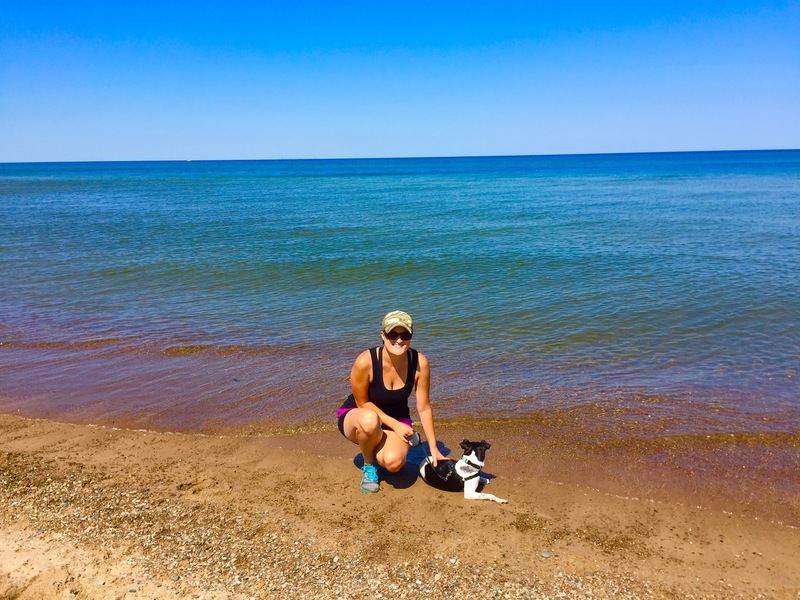 The waters of Lake Michigan fade into a fluorescent blue. 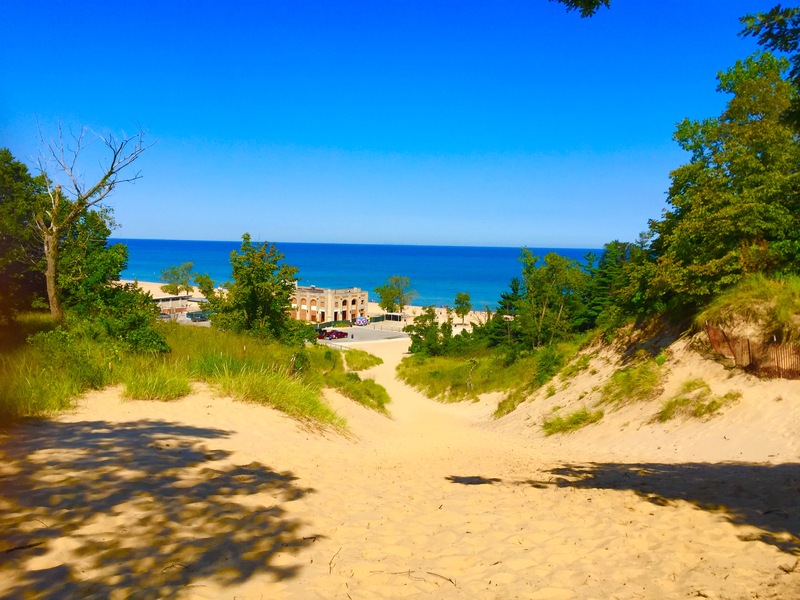 Indiana Dunes is definitely a place that everyone should visit. 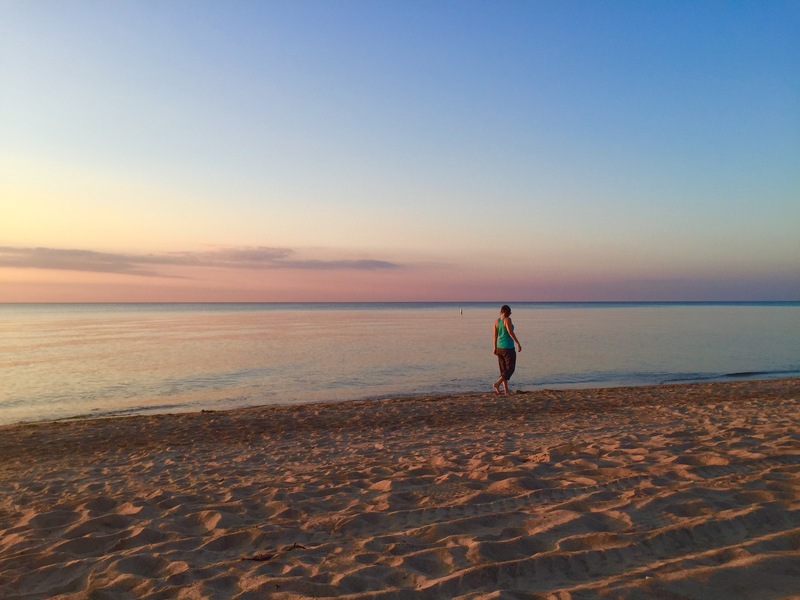 It is so beautiful and offers some awesome hiking and a beautiful beach. 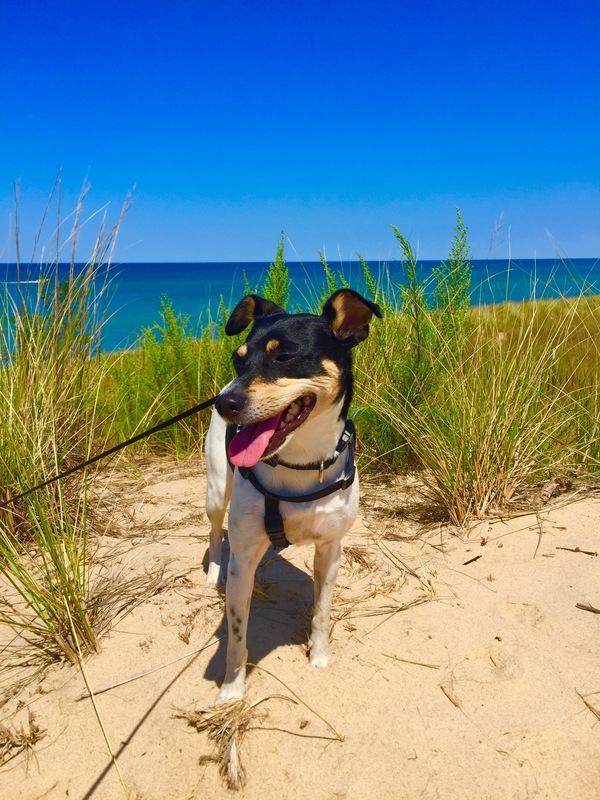 As most of you know, my pup is my traveling companion and it is important to note that there are a couple areas that dogs are not allowed at the state park. Dogs are not allowed at the swimming beach which is the area in front of the life guard towers. They are allowed to the east of this area. While we were there, there were tons of dogs enjoying the beach and playing in the water. More information can be obtained from Indiana Department of Natural Resources website. On the trail map below, you can see which trails we hiked. If you have any questions or comments, please leave them below! Thanks for your comment Nan! It was such a beautiful experience! Now all that’s left is to hike in snow!! The water looks beautiful! really neat place. I wish it was not so far away.